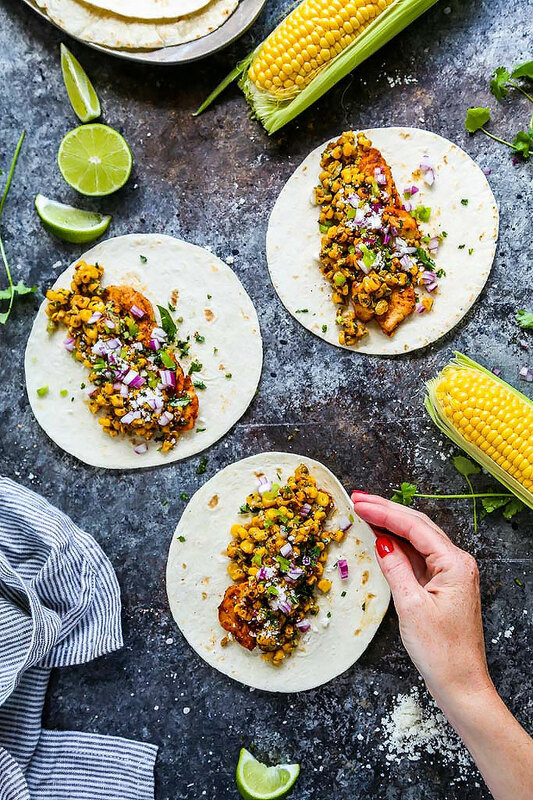 These Mexican Street Corn Chicken Tacos put a fun twist on elotes or grilled Mexican corn on the cob that’s slathered in a tangy cream sauce and sprinkled with chili powder. Plus, they come together in just 20 minutes! I’m trying to remember back to the first time I tried Mexican Street Corn … I can’t recall exactly when it was, but I do know that I was instantly hooked! It’s grilled corn that’s slathered in a tangy cream sauce and sprinkled with chili powder, cotija cheese and fresh cilantro. Really, it’s hard for me to eat corn on the cob any other way now. So, in an effort to get even more Mexican Street Corn into my life I came up with the idea of topping my Mission Organics® Flour Tortilla tacos with a corn mixture that’s got all those same flavors going on. Instead of serving the corn on the cob, in the traditional method, I cut the kernels off and turned them into a corn salad of sorts – preserving all those same great flavors. I wanted a creamy corn mixture, with a good amount of tang and a bit of heat, but I really wanted that fresh corn flavor to shine through too. Here’s a tip for getting those kernels off the cob – First shuck your corn and then seek out that bundt pan that’s buried way in the back of your cupboard. Place the corn, stalk side down into the hole of the bundt pan and then cut around the cob. The kernels will fall right down into the pan and will make for much easier cleanup – You won’t have to be chasing those kernels all over the place. Pop those bright yellow kernels into a hot skillet with a bit of olive oil and let them get nice and charred – flipping them once while cooking. Once they’re nice and charred, it’s time to dress them up. I used a tiny bit of mayonnaise (you could also use sour cream or Greek yogurt if you prefer), a good squeeze of lime juice, a bit of jalapeno for heat, garlic, chili powder, and a dash of cilantro at the end to add some freshness. Let those flavors all mingle together while you prepare your chicken. Using the same skillet for the corn, cook the chicken – less dishes are always appreciated, right? I thin sliced a couple of chicken breasts, seasoned them with a bit of taco seasoning (the kind you find in the packets), and added them to the hot skillet. The chicken cooks up really quickly – just a few minutes on each side is all it should take. After that, it’s time for the assembly process. I layered everything into some tortillas. Then, just pile on your chicken and the corn mixture. I also added a bit of red onion at the end for a bit of extra color and crunch, but that step is totally optional. 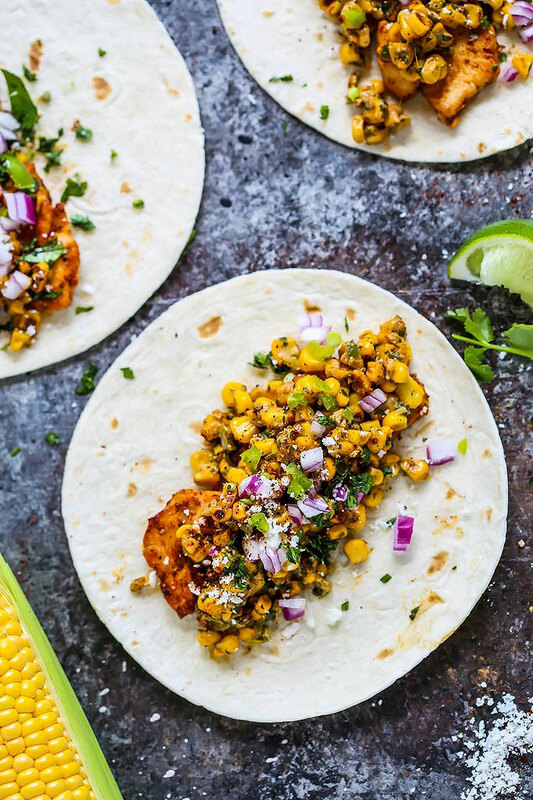 These Mexican Street Corn Chicken Tacos would also be great topped with a bit of fresh avocado too! Are you a fan of Mexican Street Corn? Have you tried any fun variations on this traditional side dish? I’d love to hear in the comments below! 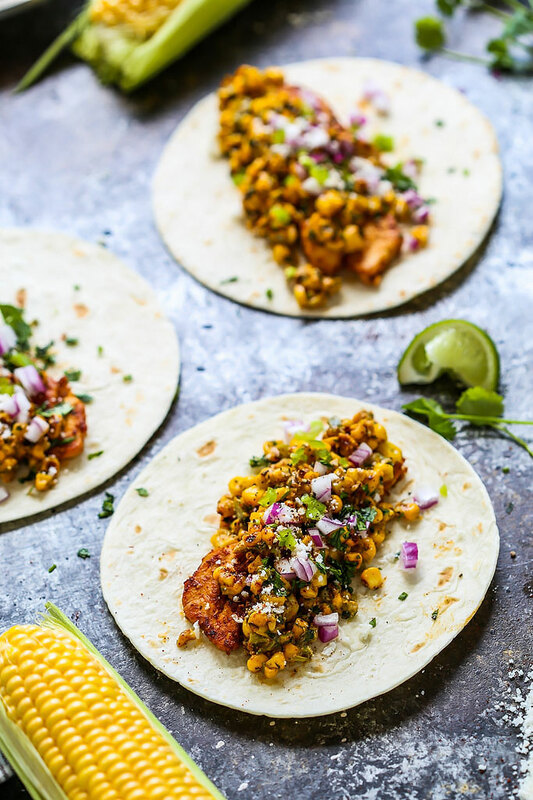 These Mexican Street Corn Chicken Tacos put a fun twist on elotes or grilled Mexican corn on the cob that's slathered in a tangy cream sauce and sprinkled with chili powder. Plus, they come together in just 20 minutes! Heat oil in a large non-stick skillet over high heat until shimmering. Add corn, season to taste with salt, and cook without moving until charred on one side, about 2 minutes. Toss corn, stir, and repeat until charred on second side, about 2 minutes longer. Transfer to a large bowl and clean skillet. Add mayonnaise, cheese, cilantro, jalapeño, garlic, lime juice, and chili powder and toss to combine. Season with salt to taste. Heat oil in the same skillet used for corn over medium-high heat. Add sliced chicken and sprinkle with taco seasoning. Stir to combine and sautee until fully cooked, about 5 minutes. Top tortillas with Mexican street corn and chicken and sprinkle with chopped red onions, if desired. Serve immediately. 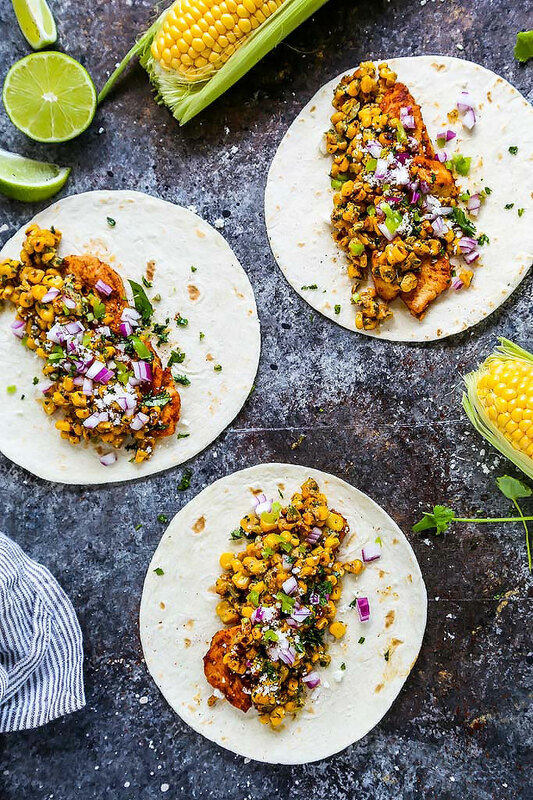 Try a creamy, fruit forward Viognier or unoaked Chardonnay with these Mexican Street Corn Chicken Tacos. Fruit-forward, with a bit of body to them, they stand up nicely to the spices in these tacos. That looks so delicious!! GREAT that they have non-GMO organic corn tortillas now! Friday taco night sounds fun Hillary! I hope you enjoy! Wow- these look AMAZING! I don’t think I’ve ever seen a more perfect summer meal. I love Mexican Street Corn, and this twist on it is so creative. Can’t wait to try these! Thanks Elizabeth – I hope you enjoy! Oh yum! Also, curious question … what is the charcoal stone/background in these photos? Hi Gretchen – The background that I use is from Erickson Woodworks – It’s their “Cookie Sheet” background. I think it photographs beautifully. This is delicious! Great recipe, thank you! !